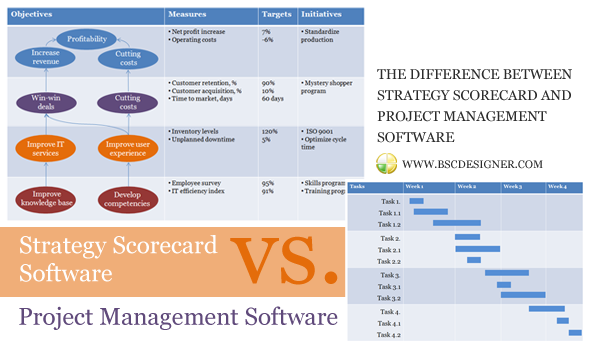 It looks like there is some confusion between the solutions for the project management and strategy scorecards. One is not a replacement for the other, and in this article, I’ll show you how they can complement each other. Accountability. In both cases, we want to know who is responsible for a certain task or goal, respectively both type of tools will give this required information. Visual picture wins. 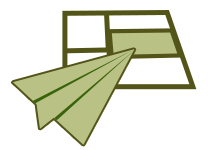 In both cases if you have a good visual picture of what’s going on (strategy map or Gantt diagram) you will be able to make decisions easier. Transparency. A common trend is fighting with informational silos, both types of software will provide you with the required collaboration functionality. Protecting sensitive data. In some cases, there is a need to limit access to certain data, in this case the PM or strategy execution solution will normally give you a way to set access rights. For example, in BSC Designer you can set specific access rights on the level of scorecards and/or indicators. Now, what about the differences?! Let’s have a look at the key parts of both types of solutions. Gantt chart is a must for any project management software, but you will rarely find it in strategy execution tools. The reason is that in the contrast from a project, a strategy is never a fixed plan. Strategy is an educated hypothesis (here are some details about scientific method) and a time-proven tool in the case of strategy is a strategy map. Due date are the key metrics for the project management. When an execution road map is plain enough we can plan accordingly: invest $X and you can expert in Y days to obtain the desired results. When the road map has many curves and uncertainties we have to use more metrics (Key Performance Indicators) to make sure we are on the right track. Some indicators from the strategy map will be powered by the metrics from the project management system. Milestones in the project management paradigm give us a clear understanding of where our project is compared to the previously approved plan. In the case of strategy execution we use a similar tool – target values for the performance indicators. In the strategy scorecard’s tools the term “initiative” is used to describe action plans for the respective business goal. The details of that action plan can be easily formalized in the project management software. What’s unique about strategy scorecard software? A good one should be a platform for the discussions around strategy, it should give your team a big picture of what’s happening in your organization, why, and how what they are doing that is aligned with company’s big goals. It will help you to keep your focus on things that matter the most. What’s unique about project management software? It’s the best on the operational level. Daily management of the team might be a nightmare without a software that will keep track of the project steps. A project management software gives a more explicit way to manage resources than a strategy execution software does. For example, the standard 4 perspectives of the Balanced Scorecard don’t include a “Resource” perspective. The topic of resources is normally explained in the supporting documentation, or in the budget initiatives aligned with business goals (that’s what you will find in BSC Designer). Can we use just PM or strategy execution software? According to my experience, it’s a good idea to split the roles between the tools. Actually, the choice of the tool should be your second priority, the first one is building the system that you are planning to automate with the software. If you have a proper strategy definition, description, and execution system in your mind (and in the minds of your team members) then you can choose any software tool, or even start with just pen and paper. Whatever your choice is, I’m sure our BSC Designer will be on your short list. Feel free to share your opinion in the comments block.